In ancient times, much of the northwestern lands of Middle-earth were covered by a dense forest. That forest stretched throughout the regions westward of the Misty Mountains and on eastward through the gap at their southern end. During the Second Age, this primordial forest was decimated by the logging operations of the Númenóreans, leaving only a few scattered remnants. Of these remnants of the ancient wood the largest was the so-called East End, the part that lay eastward of the Misty Mountains near their southern end. This was the deep woodland known in later times as Fangorn Forest. Though only a part of the vast ancient forest, Fangorn was not by any means small; it formed a very approximate square shape some hundred miles on a side, and as a survivor of the great wood of the First Age it was immensely old. Beneath the trees of the forest two rivers rose: the Limlaith or Limlight that ran out from the northeast, and the wider Onodló or Entwash. The course of Onodló ran for many miles under the trees before it flowed southward out of Fangorn Forest to cross the wide lands latterly known as Rohan. Along its eastern and southern edges, where the trees met the grasslands of Rohan, broad-leaved trees like chestnuts grew, and birch was also found within the forest, especially in its more westerly regions. On the higher lands towards the Mountains beech and rowan predominated, while on the mountain slopes themselves, the forest was formed mainly from pinewoods. These trees reflected the age of Fangorn Forest, being huge and ancient, and hung with swathes of lichen. Beneath the trees, the land could be rocky in parts, creating outcrops such as Treebeard's Hill and the rocky bay of Wellinghall. Of its native wildlife we know little, but it is established that crows of the kind known as crebain dwelt beneath the boughs of the forest's trees. Among the later Men of Rohan, Fangorn Forest had a strange reputation. It was said to be filled with a sense of peril and of watchfulness, but at least by the time of the War of the Ring the reasons behind their old tales had been all but forgotten. The earlier inhabitants of Rohan seem to have had a deeper understanding of the forest's nature: they named it the 'Entwood', recognising it as the abode of the beings known as Ents, the quasi-mythical Shepherds of the Trees. Though beings of story and legend in Rohan and Gondor, the Ents really did still dwell beneath the trees of Fangorn Forest, and had done so since long before the realms of Rohan or Gondor had existed. Indeed the name Fangorn comes from the Sindarin for 'Treebeard', the name of the Eldest of the Ents within the forest, and described as the Master of the wood. The Ents themselves had many other names for the forest in their long slow Entish tongue, but shortened Elvish forms include Ambaróna, Aldalómë, Tauremorna and Tauremornalómë. Treebeard and the other Ents were beings created in the distant past to watch over the trees and plants of Arda. In the Elder Days they had roamed widely across the World, and they seem to have played some part in the wars of the Second Age,2 but by the Third Age, for the most part they remained within the trees of Fangorn. In later times, some of the Ents of the forest had changed to become more tree-like. These were the Huorns, beings that were able to speak with the Ents, to move, and to wrap themselves in shadow. In the depths of the forest, especially among the dark western valleys of the Misty Mountains, some of the trees had lapsed into a brooding evil. Each of the Ents occupied an Ent-house under the trees of the forest, of which Treebeard's Ent-house is the only one described in detail. He translated its name as 'Wellinghall', the hall of the spring, and indeed it lay among the roots of the Misty Mountains and was fed by a fresh spring of water. Within the Ent-house stood aisles of trees that could shine with light at Treebeard's command, and also a great stone table. From this table Treebeard would drink the Ent-draughts that sustained him (and that caused extraordinary growth in beings other than Ents, as the Hobbits Merry and Pippin discovered when they sampled the draughts). Though there were many Ents within the forest, only three of them were of the most ancient lineage, dating back to times when the world was young. Their names in their own Entish language are unknown, but the Elves called them Fangorn, Finglas and Fladrif, while in the Common Tongue their names were Treebeard, Leaflock and Skinbark. It was from Fangorn, the Eldest even of these venerable Ents, that Fangorn Forest took its name. The Ents of Fangorn Forest did not generally congregate together, but when weighty issues needed to be discussed they would convene a conclave known as the Entmoot. This took place in the southern parts of the forest, at a dell whose name translated to 'Derndingle'. Given the slow, deliberate nature of the Ents and their Entish language, an Entmoot would typically last for days before the Ents would settle on a decision. While the Men of neighbouring realms shunned the forest, the Elves had a more complex attitude. This was especially true of the Galadhrim of Lórien to the north, especially as in older times the trees of Fangorn and Lórien had grown so close together that the border was not readily apparent. Indeed at one point in the distant past the King of Lórien had met with Treebeard to discuss their mutual boundaries. Elves in general had a sensitivity to the 'voices' of the trees within the wood, though they could not immediately understand their meaning. Legolas, for example, was immediately drawn to the mysterious wood. This sense of fascination was by no means universal among the Elves. When Nimrodel attempted to flee southward out of Lórien, long after Treebeard's pact with that country's old King, she felt so menaced by the dark trees of Fangorn that she would not enter the wood. More than a thousand years later, as the Company of the Ring passed through Lórien, they were warned by its Lord, the Elf Celeborn, to avoid the strange and dangerous forest that lay to the south of his land. The forest was drawn into the events that would lead to the War of the Ring some fifty years before the War itself broke out. In III 2953, Saruman had claimed Isengard for himself, and began to people it with Orcs. Isengard lay close to the western edges of Fangorn Forest, and the Orcs began to fell its trees, not only for lumber, but sometimes simply for sport. The Huorns of the western valleys learned to hate the Orcs and began to spread eastward through the forest to avoid their axes. Nonetheless the Ents, wary as they were of 'hasty' action, did not retaliate against Saruman and his Orcs. So things proceeded until 29 February III 3019, when two small creatures entered Fangorn Forest. These were captives of the Orcs being carried back to Isengard who, in the confusion of an attack by the Rohirrim, escaped into the fringes of the forest. There they encountered Fangorn himself, who was at first baffled by their appearance, but soon came to know them as Hobbits, beings from a far northern land. Treebeard had been pondering Saruman's actions for some time, and the stories of the Hobbits Merry and Pippin stirred him to action. Those two knew little of Saruman, but they did know that the Orcs that had captured them came from Isengard. This was enough to cause Treebeard to summon an Entmoot, in which the gathered Ents - after three days of discussion - decided to put a stop to Saruman and his axe-wielding Orcs. Once they had resolved to act, the power of Fangorn Forest moved swiftly against Isengard. The Ents called on the Huorns, and as night fell, Treebeard and his followers marched out of the forest and reached Saruman's stronghold. Isengard itself was no match for the Ents and the Huorns, and within a day it had fallen. The Tower of Orthanc at its centre, however, proved resilient against their attacks. Saruman remained trapped in his Tower, unable to escape while he was surrounded by defenders of Fangorn Forest. While these momentous events were unfolding, under the eaves of eastern Fangorn another encounter took place. The Three Hunters Aragorn, Legolas and Gimli entered Fangorn Forest in pursuit of the captive Hobbits. They did not find them at that time, but they did come across the returned Gandalf the White, who assured them that their friends were safe. Gandalf then led the Hunters out of the forest and across the plains of Rohan, but they would come across the Hobbits, and the Ents, when they later visited the ruins of Isengard. After the conflict, the Ents brought trees into the ruined Ring of Isengard, creating parkland that they called the Treegarth of Orthanc. At this time they released Saruman from his Tower, but retained the Key of Orthanc. When the new King of Gondor, Aragorn Elessar, came to Orthanc after his coronation, he committed Saruman's old fortress into the keeping of the Ents of Fangorn Forest. This same moment saw the final breaking of the Fellowship of the Ring. Legolas' brief visit to Fangorn Forest during the pursuit of Merry and Pippin had filled him with awe for the place, and he had made an agreement with Gimli that the two would visit it together. At Isengard they took their leave from Aragorn and their other companions in the Fellowship, and followed Treebeard back into the depths of Fangorn Forest. The locations of Wellinghall and Derndingle are not well established. 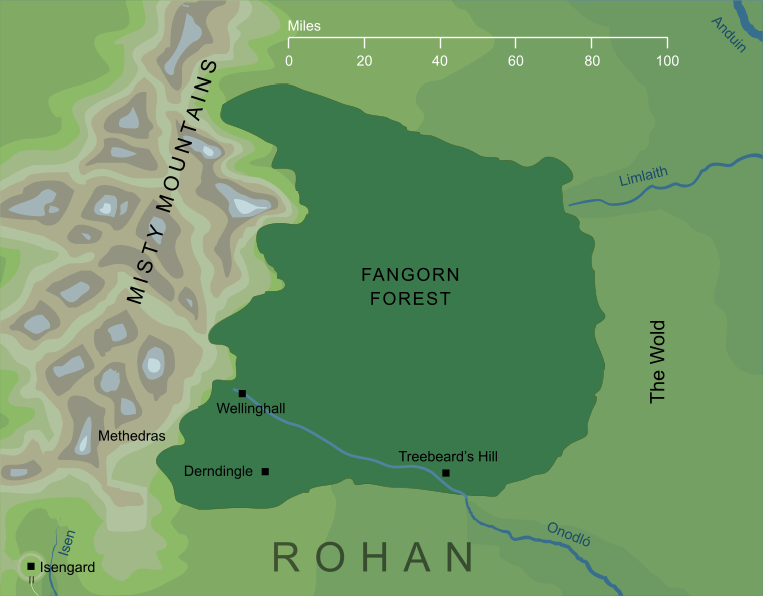 The text of The Lord of the Rings implies that Wellinghall was in the foothills of the Misty Mountains, but based on other sources, Treebeard's journey (from Treebeard's Hill) took him no further than sixty miles at the extreme, hardly sufficient distance to reach the Mountains themselves. This suggests that Wellinghall lay among rocky outcrops still some distance from the main peak of Methedras. Derndingle was south of Wellinghall, and could be reached in a matter of a few hours, placing it not far from the southern fringes of the Forest. The history of the Ents during the Second Age is vague to say they least. According to Treebeard, they were roused to action during the wars between Sauron and the Men of the Sea (that is, the Númenóreans). He might have meant the War of the Elves and Sauron that raged from II 1693 and II 1701. The Númenóreans played a major part in that War, and it would have passed close to, or even through, Fangorn Forest, so this seems the most likely interpretation. Alternatively, Treebeard was perhaps thinking of the War of the Last Alliance at the end of the Second Age, in which the Exiles of Númenor invaded Mordor and defeated the Dark Lord. Tolkien relates that the arrival of the Huorns at Helm's Deep was inspired by Shakespeare's Macbeth, or more precisely by his dissatisfaction with that play as a schoolboy. In the play, Macbeth is given a prophecy that he will never be defeated until Great Birnam Wood comes to Dunsinane Hill. 'That will never be,' says Macbeth, imagining the impossible sight of the forest moving against him: 'Who can impress the forest, bid the tree unfix his earthbound root?' In fact this never happens, but the prophecy is fulfilled when Macbeth is defeated by Malcolm's army carrying tree branches cut from the wood. The young Tolkien was unimpressed by this rather prosaic interpretation, and in his version Fangorn Forest - or at least its Ents and Huorns - really do move against the armies of the enemy. Tolkien's comments on this topic can be found in The Letters of J.R.R. Tolkien No 163 to W.H. Auden, dated 1955. The prophecy is given in Macbeth Act 4, Scene 1, and 'fulfilled' in Act 5, Scene 5. Original content © copyright Mark Fisher 1997-2000, 2009, 2019. All rights reserved. For conditions of reuse, see the Site FAQ.